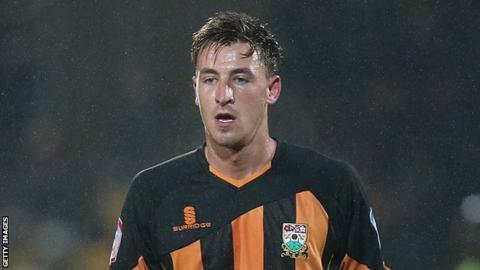 Barnet striker Jake Hyde says an improved defence has been crucial as they look to move away from the League Two relegation zone. The Bees have kept five clean sheets in their nine matches in 2013 and are one point above the bottom two. He told BBC London 94.9: "We've been really solid. [Keeper] Graham Stack has been been massively influential and pulls all the back four together. "They have all been brilliant and that is starting to show in our results." Stack himself has hailed the central defensive partnership between Bondz N'Gala and David Stephens. "Both of them are big, physical lads and they have formed an understanding and relationship quickly in training," Stack told BBC London 94.9. "We have looked good defensively and have limited teams to few chances in recent weeks, which is pleasing." Barnet are 21st in the table following Tuesday's 2-0 win over Southend United at Underhill. Hyde is looking to build on their victory over the Shrimpers when they travel to bottom side Plymouth Argyle on Saturday. "You have always got to look at your home games for wins but to beat a side like Southend is a fantastic victory for us," the 22-year-old added. "We grew in confidence as the game went on and there is a lot of self-belief in the side at the moment. "Plymouth is a massive game. It is a very hard game to go and will be a real fight for us but we will do everything we can to get the three points."